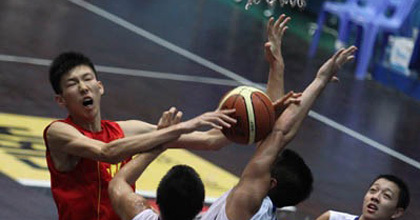 Qi Zhou is one of the biggest talents in Chinese basketball. heinnews’s David Hein went out and found the 16-year-old center for a brief interview about the development of his game; trying to deal with media attention of his emerging stardom and liking Dwight Howard or Wang Zhi Zhi. heinnews: What were your thoughts on the Albert Schweitzer Tournament? Qi: The players in this tournament are stronger than what we had before. I learned a lot, especially that it’s a lot more physical playing at center. This is what I really experienced at this tournament. heinnews: How important was this experience for the development of you and the team? Qi: This is definitely stronger than the U17 World Championship physically so it’s really good preparation for the U17s. We will go back to China and look at what we did and what we need to do. I will be more focused on those fields. Europeans are a lot stronger than me. heinnews: In your group at the U17 Worlds are Egypt, Australia, Czech Republic, France and United States. What do you think about your group? Qi: Asia’s level is still lower compared to the other teams in the world. So these will all be strong teams. We will just try our best to do the best we can. heinnews: You have been receiving a lot of attention back home. What are your thoughts on the attention and dealing with it? Qi: (laughs) – I’m just trying to be myself. I’m trying not to pay attention to the media attention. I just want to be myself. I’m trying to improve and just get better. heinnews: What things are you working on? Qi: Getting more mass and stronger. Also techniques under the basket. heinnews: What about your goals for the future? Qi: (laughs) I am trying my best for the team’s goals. This year we want to do good at the U17s. heinnews: We have read that you like to watch Dwight Howard. Who are some of your favorite players? Qi: Wang Zhi Zhi is one of my idols. I want to be like him. Power forward with good techniques.